At this time of year, all I want to do is hibernate and drink copious amounts of creamy coffee. Christmas and New Years are past and the cold has officially set in here in the NW. Instead of embracing the grumpy bear persona – I should be taking brisk walks and eating delicious healthy fats and life-giving leafy greens. Ha ha! Let’s not get too crazy now. One step at a time. Food first, walk later…maybe. So the real question is: What’s for dinner? 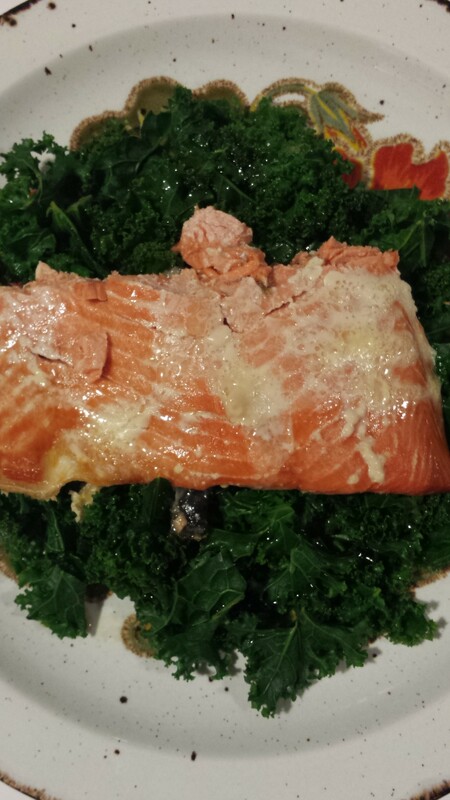 Answer: Baked salmon and wilted kale! Stay with me. It tastes better than it sounds. Bake some salmon. Rip up some greens and add a little flavor. Enjoy! It really is that easy. Wild salmon and kale are both considered super foods! Together they are full of iron, calcium, Omega-3 and Omega-6 fats, and vitamins D, B12, B6, B3, K, A, and C. I’m not even mentioning all of the other crazy nutrients salmon and kale contain. I love salmon because it is just so satisfying and filling. And I love kale because I’m a little weird and I like the strong, deep, green flavor it has. I also like the fact that kale doesn’t disintegrate and get slimy the way spinach does when it’s cooked for longer than a minute. This dish is so simple it doesn’t really need a recipe, but I’ll give you one anyway. This is a perfect deep S meal if you follow the Trim Healthy Mama plan. But first, a few notes from my inner food/health nerd. Some vitamins, including A and K, are fat-soluble – meaning our bodies rely on the presence of fat to properly absorb them. Iron can only be properly absorbed when paired with vitamin C (found in vinegar), and calcium requires vitamin D (found in salmon). When you compare the nutrients found in these two super foods – you find a match made in heaven. You can find links to more detailed explanations at the bottom of the post. Preheat oven to 350. Place salmon (skin side down) in an oven safe pan and dot generously with butter. Bake for 15 minutes or until the flesh flakes apart easily with a fork. Remove from oven. While salmon is baking, prepare the kale. Begin by washing thoroughly and shaking off excess water. Remove the tough center core from each leaf and cut or rip remaining greens into large bit size pieces. Heat a medium-sized skillet over medium high heat and toss in kale pieces. Stir to heat evenly and continue to cook until kale is slightly wilted. A couple of tablespoons of water can be added if necessary to prevent sticking and burning. Pile wilted kale on a plate and drizzle with a few splashes each of vinegar, sesame oil and aminos. Top with a serving of salmon and enjoy! Do you have a favorite way to eat salmon or kale? I’d love to find some new ways to enjoy these super foods!